While the Spurgeon Baptist Association wholeheartedly supports the international, national, and state mission offerings of the SBC (Lottie Moon, Annie Armstrong, and Viola Webb), we have a fourth annual offering. The Isaac McCoy Associational Mission Offering is gathered each summer. 100% of the proceeds will be used to fund new works and strengthen churches within the Spurgeon Baptist Association of Churches. Promotional materials are available in .pdf format at the bottom of this page. Please contact us at spurgeonassociation@gmail.com if you would like to have offering envelopes mailed to you. 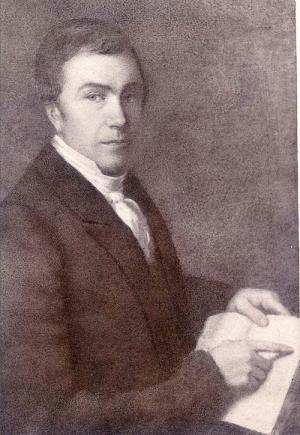 Isaac McCoy was active in Indian missions in nine states and was the first Baptist to enter Kansas and Nebraska working among the Indians. He was strongly Calvinistic in his doctrine being sent out from his home church, which held to the 1689 Baptist Confession. He even named his son John Calvin. The mission to the Potawatomi Indians is located just one mile from our Kansas-Nebraska Convention of Southern Baptists building off interstate 70, next to the Kansas Museum of History. The original building of the mission is still standing and serves as a museum and is available for meetings for a modest fee. The story of Isaac and Christiana McCoy and their missionary associates to the American Indians has long been eclipsed in Christian literature by other such notable worthies as John Eliot and David Brainerd, yet the scope of what Isaac McCoy’s missionary endeavors entailed and in the end what was achieved far exceeded that of his early predecessors in Indian missions and the comparative obscurity therefore is undeserved. Clearly no one accomplished so much good not only in his own day but for succeeding generations of American Indians as did Isaac McCoy. When Isaac McCoy lay dying in 1846, his last words, spoken to his beloved wife Christiana, were, “Tell the brethren, never to let the Indian mission decline.”His story is one of the great chapters in the history of Christian missionary endeavor, and a story of great courage and perseverance in the cause of Christ by those who truly loved the American Indians. Mr. McCoy and his wife entered upon this missionary work with all the zeal and strength of faith that characterized the life and labors of Mr. and Mrs. Judson. And their faith did not fail. Deprivations, sickness, and sorrows such as but few mortals know were not strangers to them. Mr. McCoy rode hundreds of miles through the wilderness, and swam the swollen streams, lying on the wet ground at night, for the sake of carrying forward his mission. He went on horseback to Washington several times to interest Congress in measures beneficial to the Indian. Many months would be occupied in these journeys. One of the severest trials that Mr. McCoy was called to bear was that during his absence from home sickness and sometimes death would visit his family. Five of his children were called by death at different times while he was absent from home. Persons of narrow selfish views would readily call him cruel and indifferent, but men who could rise to his plane of devotion to the work that he believed God had given him can see that his loyalty to the Master was superior even to parental affection. No man loved his wife and children more than he.